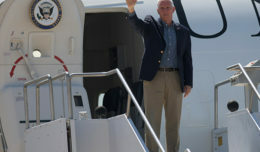 LUKE AIR FORCE BASE, Ariz. — Cooler weather and browning leaves harken the onset of autumn, but so too does a runny nose and sore throat. Influenza is a contagious disease that spreads around the United States every year, typically between the months of October and May, according to the Centers for Disease Control and Prevention. A variety of symptoms are brought on by the flu, including fever, chills, sore throat, muscle aches, fatigue, cough, headache, and runny or stuffy nose. Many of these symptoms are common in other illnesses; however, and can make the flu difficult for untrained individuals to diagnose. Additionally, the flu can lead to more dangerous conditions like pneumonia and blood infections, and can even cause diarrhea and seizures in children. 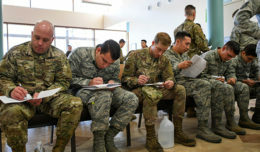 As the flu season begins to sweep across the nation in full effect, the Air Force is stepping up its efforts to combat sickness and maintain a healthy and ready fighting force. 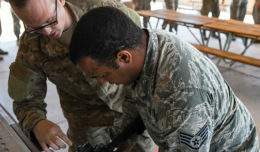 These efforts are among the top of the 56th Medical Operations Group’s priorities, where MDOS Airmen are preparing to fight the flu through both a campaign for awareness and a drive to vaccinate as many base personnel and community members as possible. The flu is spread by many different Influenza viruses, some more common than others, and most of them constantly changing. Fortunately, the MDOS is equipped to counter this threat. “We carry the quadrivalent vaccine, which protects against four of the strains of the influenza virus which are predicted to be the most prevalent this season,” Banghart said. In combination with healthy sanitation practices like washing your hands often and covering your mouth when sneezing or coughing, getting a vaccination is one of the most important things you can do to help prevent the spread of the flu. Each year, thousands of people in the United States die from the flu. The CDC recommends that everyone receive a dose of flu vaccine each season.